Our Sepia Saturday format has changed a little for the month of August. Instead of one image per week, we have one image for the whole month and are welcomed to post as much or as little as we like during the month. It feels a bit odd for me to use one image as the source of inspiration for the whole entire month, so I think I’m going to go on-theme for the first post and then choose photos off-theme for the other three weeks. Our prompt image is a lovely, billowy wedding photo, and of course I have more than one wedding photo, but this one felt right to include this week. 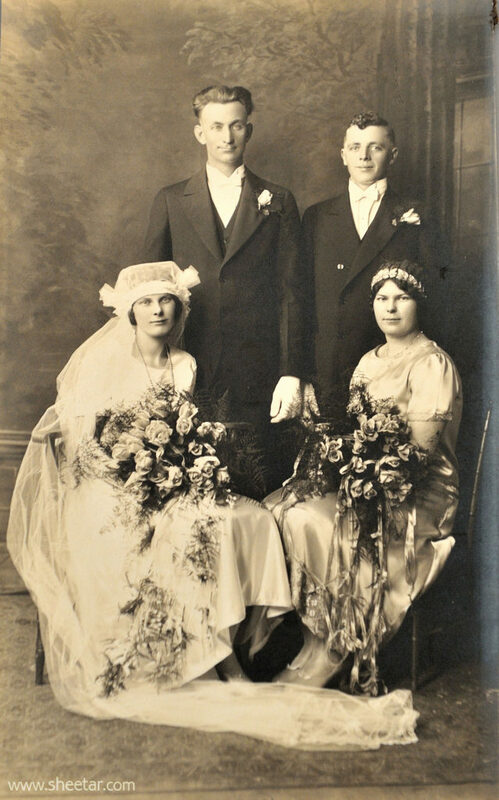 My photo here is of the marriage of Garret Fylstra and Gertrude Meyer on 31 March 1926 in Paterson, New Jersey. They were married by the Rev James Holwerda at the Christian Reformed Church of Midland Park, New Jersey. Our happy couple is on the left side of the image while their two witnesses, James de Waal Malefyt and Jessie Meyer on the right. Jessie is Gertrude’s sister and James married Jessie and Gertrude’s cousin not even a year prior. To make things a little more complicated, their cousin was also their step sibling since after Jessie and Gertrude’s mother died, their father married their mother’s sister who had also just lost her spouse. It makes for an interesting and complicated family tree but wasn’t something completely unheard of during that time. Gertrude is my husband’s grandmother, and she lived to age 93, passing away on 4 November 1996. She outlived her husband by almost 30 years, and they had 9 children together, two of whom didn’t live past infancy. My photo may not be quite as billowy and romantic as our prompt image, but it’s a pretty wedding nonetheless! 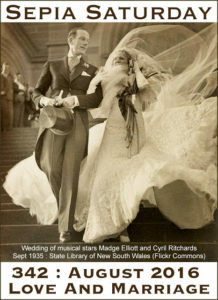 I think it would be amazing to find such a billowy wedding portrait in our own collections. Quite interesting family tree too. Lovely photo. The veil is very interesting, more like a hat in some respects. I do like this photo. The clothes are beautiful and the flowers are amazing. Thanks for sharing. Hi Peter! Actually, both Garret and James (and the two girls) were born in the USA, but their parents were all immigrants from Holland. I blog pretty regularly about my husband’s family who are descendants of Dutch immigrants (Jaarsma, Meyer/Meijer, Dijkema, Fylstra/Fijlstra, etc) so yes, you have my permission to mention my blog! I’ve traced back his family line into the 1600s in Holland, and it’s so wonderful that the birth/marriage/death information is all online. Much easier than my own Polish ancestry! I’m loving that bouquet and hoping it was somehow saved for years to come. Would have been easy to hang up and dry and make a beautiful memory piece. I don’t think it was saved! I know they saved the veil though and my mother-in-law tells me that her mother didn’t like it because it was too big and used it as a ‘punishment’ for the girls. If they were bad, they had to wear it! A lovely picture and beautiful flowers. Lovely photo. And I have really enjoyed the comments — and your follow-up comments. Makes the photo so much more interesting. Love those “complicated” genealogy matches — as I have a few of my own.